[New for 2014] Front Porch was nice enough to send over samples of both of their new 2014 flavors. I already covered the tasty Charleston Sea Salt Caramel, so let's take a quick look at their other offering. If you love coffee ice cream, I can't imagine you not likely this ice cream. It's got that flavor that I've come to aspect from the better coffee ice creams. It's not sweet or milky, just a straight, clean coffee flavor (sorry I can't describe it better because I'm not a coffee ice cream fan as many of you know). The small caramel swirls weren't prevalent enough to do a whole lot for me, but the brownies are definitely a winner here. They are a decent size and have a nice middle of the road texture that's neither gooey or dried out. I had several bites that had two brownies on them and I found them quiet enjoyable. In fact, it made me wonder something. 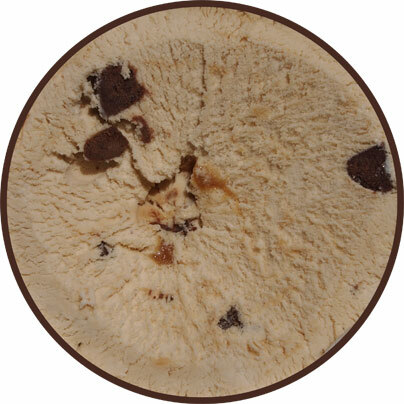 Why doesn't someone do like a caramel base ice cream with coffee infused brownies? Give me a nice caramel backdrop with nice little shots of coffee and brownie. It would be cool.... but I digress. So, there you have it. 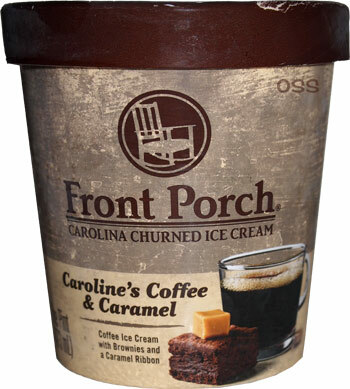 Front Porch now has a coffee flavored member as part of it's 21 flavor line up and they did a fine job. If you are in the Carolinas or the surrounding area, keep an eye out for this premium brand.